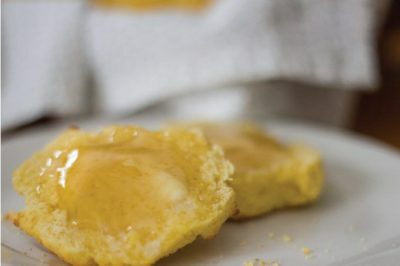 The best fluffy gluten-free biscuits you'll find! I’m into comfort foods that taste good but are secretly healthy. Like butter pecan ice cream. 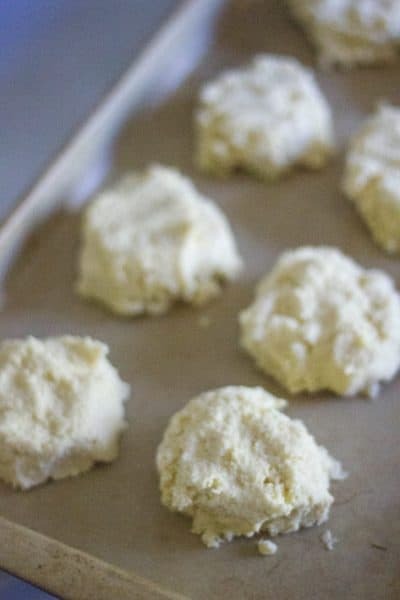 But since it isn’t socially acceptable to have ice cream for breakfast, here’s another option- fluffy, easy-to-make, gluten-free biscuits! 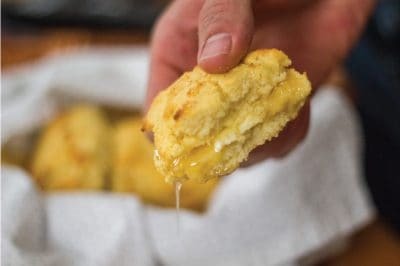 You can make a batch of biscuits quickly, without worrying about your breakfast being unhealthy or resorting to a sugary, high-carb breakfast that will make you crash in a few hours. Nope, these paleo biscuits are healthy and full of substantial ingredients that will keep you feeling great all morning, even if you don’t toss a fried egg on top. Although you should try that too… With cheddar cheese. And then put it in the toaster oven for a bit to melt the cheese. Mmmmm. This is yet another recipe kindly given to me by my chef-genius hubs. Isn’t he great? In my opinion, these are the best gluten-free biscuits ever- but don’t take my word for it! Try out this recipe for yourself. Before I give you the super-easy gluten-free biscuit recipe, let me tell you about why you should make biscuits from scratch! Store-bought gluten-free biscuits usually have preservatives, whether you buy them frozen or fresh. I just can’t do store-bought gluten-free baked goods anymore… They have a funny aftertaste to me. These biscuits, on the other hand, are completely made from scratch, and they use ingredients that you know you can trust. Plus, you just can’t beat that fresh-out-of-the-oven taste! If you have celiac disease or you’re gluten-free, you might be tempted to sub out regular flour for gluten-free flour. It’s an easy substitute, and lets you make all your favorite things without changing up the recipe too much. Or you can buy tasty things at the store that are gluten-free! The problem with gluten-free flours is their ingredients and fillers. Pillsbury gluten-free flour, for example, is made up of rice flour, potato starch, pea fiber, tapioca starch, and xanthan gum. Just because it says “gluten-free” doesn’t automatically make it healthy. Many gluten-free recipes use xanthan gum as a thickener. This stuff can be really tough on your gut and digestion, especially if you already have gut issues, as many gluten-free people do. I used to use xanthan gum in my gluten-free baking, but I quickly noticed that it wasn’t doing nice things to my gut. So, these gluten-free biscuits are made without xanthan gum. They’re healthier for your gut and better for you than anything made with normal gluten-free flour or xanthan gum! Potato starch is low in nutrients, and it’s usually genetically modified. It’s also cheap, which is why it’s an ingredient of many gluten-free flours. Rice flour and pea fiber are also low in nutrients and could be rough on your gut too, especially if you’re sensitive to gluten. Rice flour can high glycemic, meaning it has lots of carbs and could potentially raise your blood sugar. It’s not a great choice for anyone trying to eat low-carb. Many gluten-free biscuit recipes use rice flour or other gluten-free flours. These biscuits are unique- they use a mixture of almond and coconut flour! But don’t worry, the final product doesn’t taste coconutty. 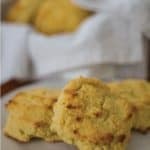 These paleo coconut flour biscuits don’t just pretend to be healthy- they really are good for you. And just because you’re eating healthfully doesn’t mean you can’t have yummy comfort foods like paleo biscuits and gravy or biscuits with honey! Enjoy making these gluten-free biscuits from scratch. You’ll never want to buy biscuits again! If you aren’t making these right now (or even if you are but you want to save the recipe!) make sure to pin this for later! You can see ingredient substitutions below. You’ll also need a way to grease your baking sheet– I prefer to either rub it with a stick of butter or use avocado oil in a pump spray bottle. I’ve been using mine for a while now and it works great for me! I love this little bottle because you can fill it with whatever you want, and it isn’t a source of single-use plastic or toxic aerosol fumes. Better for you and the planet! 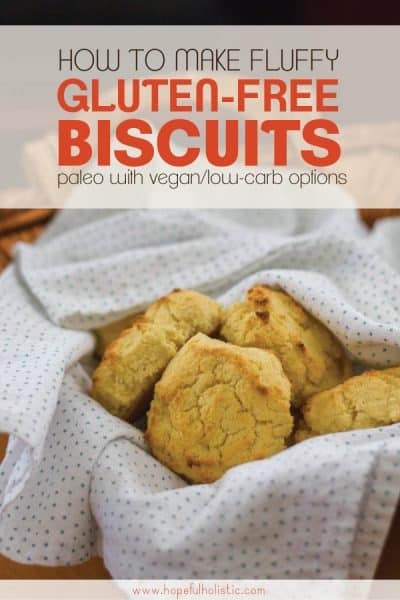 These paleo, gluten-free biscuits are easy to make and so much better for you than store-bought gluten-free baked goods! Make these to go with gravy, fried eggs, or just butter and honey. Combine all dry ingredients in a large bowl or mixer. Mix well. Add all wet ingredients to dry ingredients. Mix until just combined. Store baked biscuits in the fridge. These biscuits hardly puff up at all, so you can put them pretty close together on the cookie sheet. Leave about 1/2 inch between each biscuit and the sides of the baking sheet, and shape them into about the shape you want. These aren’t quite drop biscuits, but you don’t need to spend too long molding them. Try to make them all close to the same size so that they bake at the same rate. 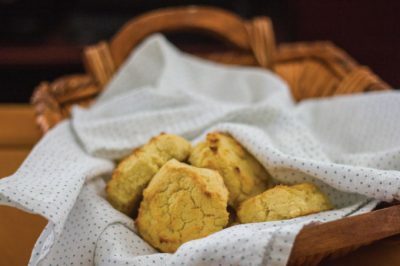 To make these gluten-free biscuits vegan, you can substitute the eggs for flax eggs, the butter for coconut oil, and nut-based or coconut yogurt instead of dairy yogurt. The xylitol can be omitted, or substituted for honey. You can also use Swerve or stevia for a low-carb option. For the best consistency and texture, don’t change the ratio of coconut to almond flour. 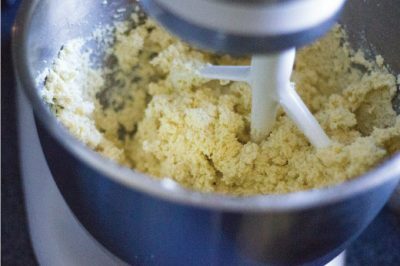 You can, however, exchange the almond flour for an equal amount of cassava flour. 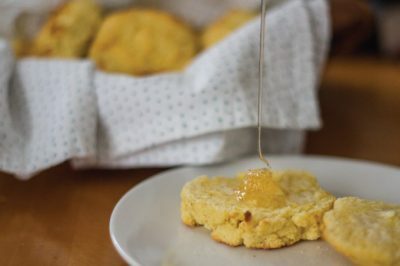 If you want to make sweeter gluten-free vanilla biscuits that are yummy all by themselves or with a touch of honey, simply add 1 tablespoon of vanilla to the wet ingredients, and double the sweetener. You can easily double this recipe and freeze the batter or the baked biscuits to save for later! 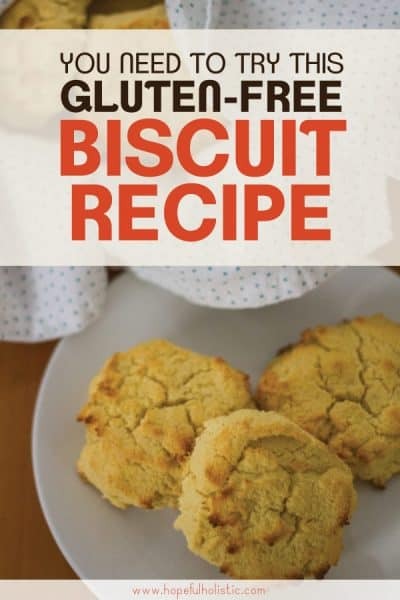 This makes it as easy to make more biscuits as it would be to buy unhealthy, pre-made, store-bought gluten-free biscuits. Make sure to let frozen biscuits thaw completely before toasting or heating them. Yay! You have biscuits! Now what? I also enjoy making little slider-style sandwiches from biscuits. They store well in the fridge so you can make a bunch and eat them all week, for breakfast, snacks, or lunch! They also make a great breakfast side to my healthy coffee substitute. Hungry for more healthy recipes? Did you like this recipe? Pin it!